Are you about to start on your first bead project? Or maybe you’ve already nailed down the beading basics but you’re ready to learn new beading techniques? Everyone needs a place to start and every beader is always searching for new beading ideas. This is why we’ve put together this new free eBook on how to bead, filled with simply beautiful projects that will get the whole world stringing beads. No excuses! We all started at the same place … the beginning. Each one of us held beading wire in one hand and a pile of beads in the other, and we began to bead! It’s amazing where the jewelry-making path takes us after this hope-filled start. Each beader makes different stops along the way: Some embrace crystals, others gemstones with every other bauble thrown into the mix. One day you don’t know how to bead, the next day you are an official “beader,” and life as you knew it changes forever more. Everyone needs a place to start, so I’m excited to introduce this new collection, Beading Instructions: 5 Free Beading Projects to Learn How to Bead. This free eBook is a complete beading for beginners guide with quick and easy bead instructions. Each bead project includes a fabulous photo. Turn to pages 6 and 7 for illustrated descriptions of the essential beading techniques such as crimping, knotting, wireworking, oxidizing silver, and more. If you already know how to string beads and are looking for inspiration or quick bead designs to make for your friends, this free eBook will also suit your needs. This free eBook is a complete beading for beginners guide with quick and easy bead instructions. Each bead project includes a fabulous photo. Turn to pages 6 and 7 for illustrated descriptions of the essential beading techniques such as crimping, knotting, wireworking, oxidizing silver, and more. If you already know how to string beads and are looking for inspiration or quick bead designs to make for your friends, this free eBook will also suit your needs. What’s Inside Learning How to Bead? 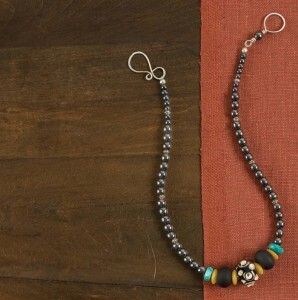 This lightweight bead project combines lava beads and lampworked coins to present a casual, wear-to-the-office look you could make in a wide variety of colors. 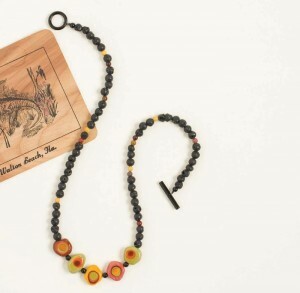 Lava beads are made of natural rock and have a great earthy appeal, enjoy stringing them! Stringing beads for this piece is three times the fun! 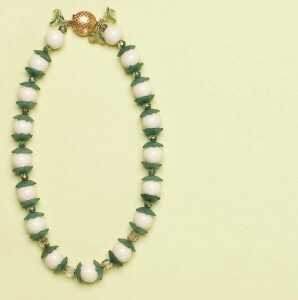 With triple strands, this bead project uses the same simple bead stringing technique. The sophisticated colors in the beautiful etched shell pendant makes this piece subtle enough to wear to the office and elegant enough for a night out. Combine lampworked disks and rondelles with hematite beads. This lovely piece can go formal as well as casual. 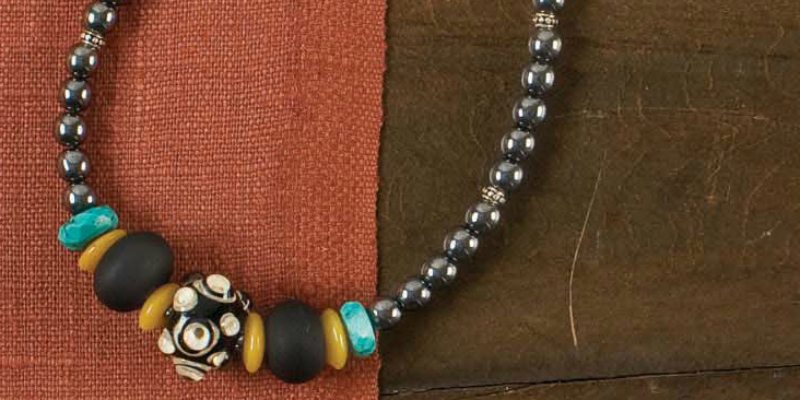 This cool, contemporary necklace owes its drama to a striking combination of black, yellow, and turquoise beads. Feel free to use these beading instructions to mix in other elements and explore your own beading ideas. 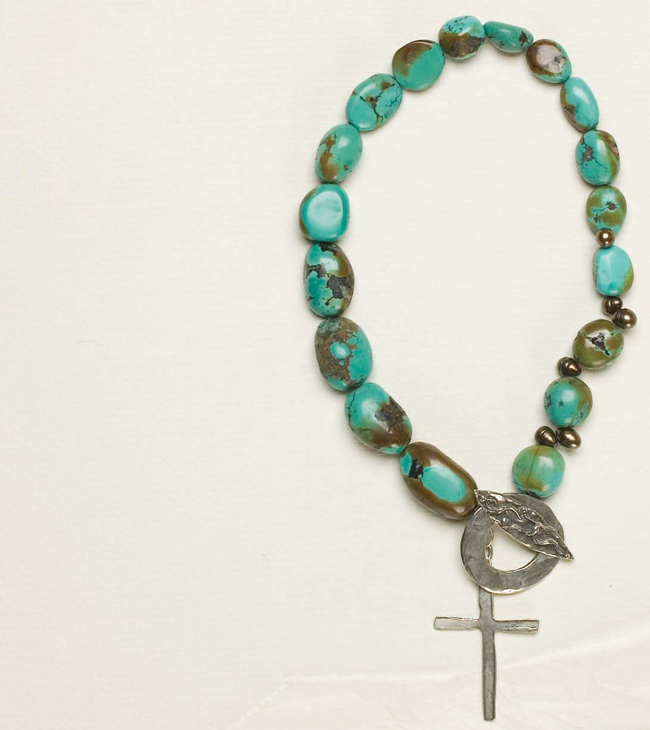 Turquoise nuggets that increase in size toward the center of the necklace help spotlight the dramatic toggle clasp and cross pendant. This bead project is a blue-lover’s delight. You simply can’t go wrong with silver and turquoise! If desired, you can leave off the cross pendant for a simpler necklace design. This final piece is perfect for all seasons. The Lucite beads and flowers are fun to work with and have a timeless appeal. When stringing these beads, make sure that the front sides of two flowers cup the larger round bead between them. Download your free eBook, grab your pliers, pick out your colors and create amazing flower bead designs for your loved ones. Never worked on a bead project before? Don’t know where to start or how to finish? Wondering how to tie beading knots? For those who need to brush up on beading basics before starting, turn to pages 6 and 7 of this free eBook to find illustrated bead instructions on crimping, knotting, wire working and more. Each bead project includes luscious photography and clear step-by-step bead instructions. Even if you’re just starting to learn how to string beads, you’ll be able to make these beading designs in your favorite colors, and get inspiration to create your own beading ideas. In the beading for beginners section, learn how to tie beading knots, such as the overhand knot or the lark’s head knot. 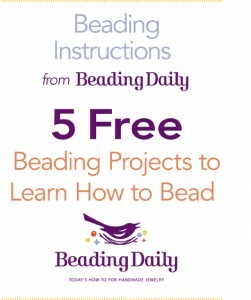 Join in the fun and get your free Beading Instructions: 5 Free Beading Projects to Learn How to Bead eBook.